I post this every couple of years because 1) it is such a special memory and 2) I am VERY sure that others share similar stories from their childhood. I’d have a tough time getting to sleep the night before but when morning came I was wide awake and giddy with anticipation. Labour Day !!! It was always a big day in Windsor, Ontario where I grew up – what with Windsor being the automotive capitol of Canada. The unions were strong and what they did always had rippling repercussions throughout the city. On this day there was always a huge parade down Ouellette Avenue to start things off in the morning. Brass bands, one after the other, and marchers – Labour’s finest – proclaiming proudly their local’s credentials. Even my Dad took part on occasion – being an active member of the American Federation of Musicians local 566 – established in 1911. So we’d all get up, get dressed – forget about breakfast for me – I had far too many butterflies to swallow a thing! Then we’d walk a few blocks to the big intersection of Giles and Ouellette – where the Cenotaph proudly stood, find a prime viewing spot and eagerly wait for flag bearers to appear. If we kids needed a better view we took turns on our Dad’s shoulders. At 6 foot 5 he had a perfect vantage point. The parade was fun but that was not the main attraction for me on Labour day…the best was yet to come. Fireman’s Field Day and Carnival! Immediately after the sounds of the last band faded we quickly headed home, got in our Oldsmobile and drove to Jackson Park. The Carnival – oh I must have sawdust in my veins – how I loved that Carnival. From Labour Day and for the week after – the carnival held me in its thrall. The crowds milling about – who would be there? Chances were we’d run into a bunch of people that we knew. The sounds of the rides, the shrill calls of the guys who wanted to sell you 3 tosses at the bowling pins, the sing song of the vendor with his awesome display of pink cotton candy – all beckoned. The rides. It was a love/hate relationship – especially with the Ferris Wheel. It held a fascination for me and I loved being at the top and seeing all the way across town. But, you see, in those days I also had a bit of a fear of heights so there was always an edge of danger lurking. The Carnival always came through and delivered on its promise of fun and excitement. Later I found out that the reason we called it Firemen’s Field Day is that it was sponsored by Windsor Firefighters. Okay, so far we have a parade, a carnival, wonderful family day – but that’s not all that made this day so special my friends. This was the official last day of summer – next day – school! Now, bear with me. I know that for a lot of you that wasn’t exactly what you wanted to be looking forward to the next day but I was one of the kids who loved school. New pencils sharpened and ready – just could hardly wait to start the new school year. So Happy Labour Day (or Labor Day) my dear friends and readers. I hope you have even a fraction of the fun that I remember on Labour Day and make some of your own memories. And whether you start school tomorrow or return to work and embark on some entirely new adventure I hope it will energize and delight you. I sincerely hope you have enjoyed reading. Please share YOUR special memories as well. Parades, first day of school, local carnivals – whatever shines brightly in your memory. 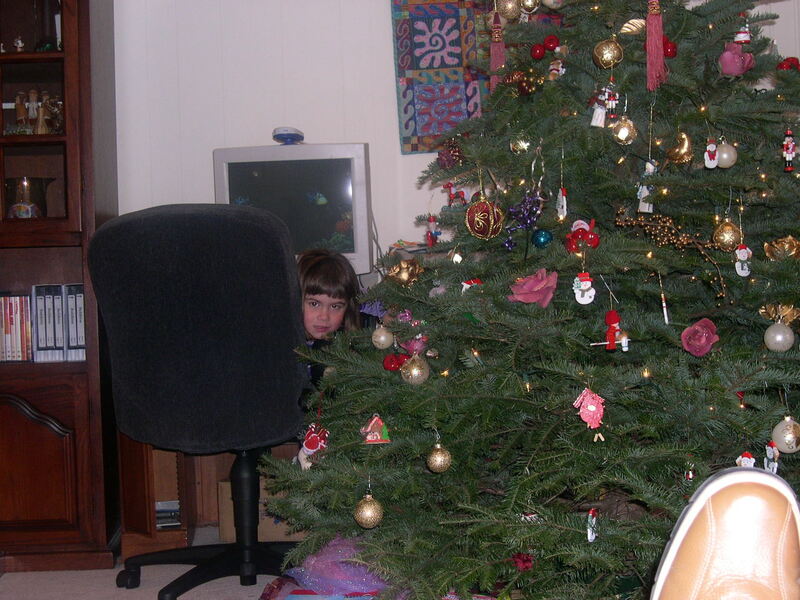 The earliest memory I have of Christmas was when Santa came into our living room, unannounced, and handed out cookies to my sister and I. We were so young at the time that my brother wasn’t even born yet! We found out later it was our elderly (she was assuredly younger than me at the time) next door neighbor Mrs. Dubs. We should’ve been tipped off by the hermit cookies she was famous for. But at ages 2 and 4 we were too ready and willing to believe it was really Santa. And I must admit, just a teensy bit scared of this bouncy red clad intruder. A couple of years later – a bigger deeper voiced Santa appeared – very jolly and carrying lots of gifts. I remember not being quite sure of the situation – my little sister wasn’t either – but we were delighted nevertheless. It wasn’t until much later that we learned it was our daddy himself! It was around that time, maybe a couple of years later that our mom would take us downtown and we’d visit Santa himself at Smith’s Department store. We’d then visit the perennial Christmas exhibit set up on the walkway between Smith’s and Bartlett’s (the snooty store). It was one of those you used to see with miniature mice sitting around playing cards and yet more mice jamming away on their musical instruments with appropriate Christmas music playing in the background. We LOVED it and couldn’t wait to go see it each year. But it wasn’t long before that display was overshadowed by the one across the river. We’d all get on the bus at the Tunnel in downtown Windsor for the short drive across to the states. Once on the other side we’d trek on over to Hudson’s and join the throngs already assembled to ooh and aah at the window displays there. To this day I haven’t seen anything to quite match the magic and fascination of those Christmas scenes. There’d be anything and everything from solemn nativities to Santa’s elves at work to children singing around a beautiful twinkling tree. And I am so glad that my elementary school years were well before the years of rigid political correctness. We had a Christmas pageant every year and for many of those years I got to sing in the choir. And I enjoyed every moment of it. As a little girl from a Jewish home who was simultaneously learning Torah and Hebrew, it didn’t bother me one bit that we were singing Odes to the birth of Christ. To me it was a time of fellowship and joy and I belted out those carols with gusto! And so I wish to all of you – whatever your personal beliefs may be – enjoy this time of year for the sheer joy of it. If your personal beliefs differ then take the opportunity to focus on the good in people. I believe that is always essential and especially when day after day we are reminded of the worst. Merry Christmas, Happy Holidays and a very Happy 2015 to all! Yep, it’s cool in some circles to disdain the social media queen bee. Some of my best friends won’t go near the place. Why would they want to waste their time? True, if you’re not careful it can chew up your minutes like Pac Man. Yesterday I was going through some old family photos and wavering between tears and laughter as memory after memory zinged me. I found one of my son and I , taken some years ago at the beach. 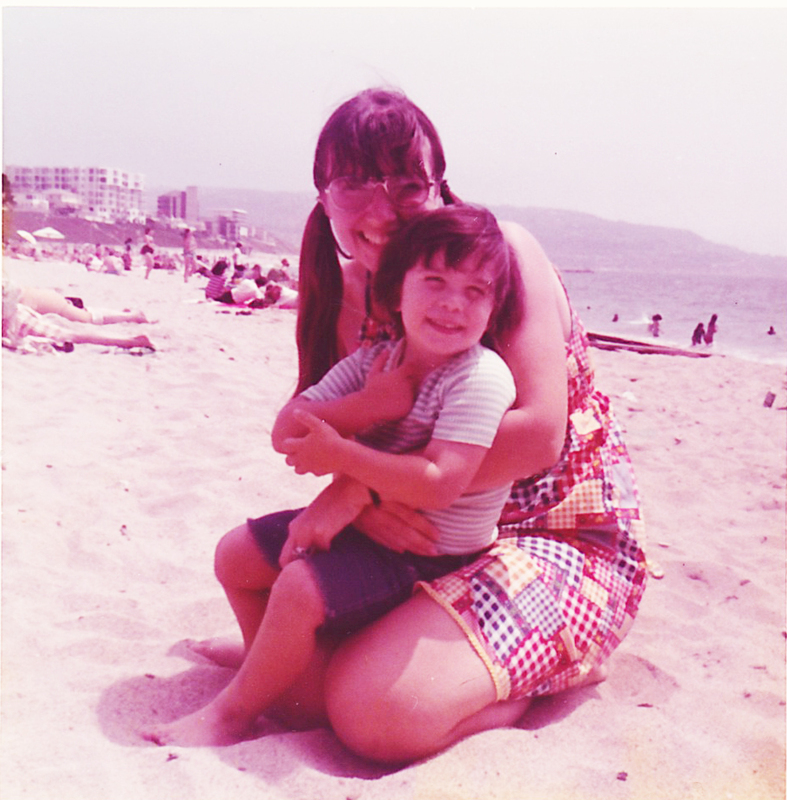 We were both caught in a moment of sheer delight as he sat on my lap in the sand at Santa Monica. I felt the joy of that moment and wanted to share it with my friends. So I immediately scanned the photo, did what I could with the lighting in Photoshop – which wasn’t much – and posted it on my Facebook page. Late today I logged on to catch up on what was happening in cyber land and wow, a couple dozen friends had acknowledged and ‘liked’ the photo and a few even commented. These were friends and family who represented many phases and stages of my life and I was momentarily overtaken by the sheer idea of it all. Friends from elementary school in Canada for heaven’s sake – friends from nursing school – a cousin from Scotland that I have never met (one of these days Aly ) Other family that I haven’t seen in decades or get to see less than once in a blue moon. And friends of today who share my present life – whether they be quilters, artists, lost coin members, fellow music lovers, photographers – you name it – whether we’ve met ‘for real’ or just online. Add to that, former work colleagues and clients who it is a pleasure to stay connected to. Now, while I enjoyed the idea of sharing this photo, it was hardly something that I would attach to an email and send to 99% of the people on that list. It just wasn’t that big a deal. Picture this imaginary conversation via email: “Oh hey, Janice – look at this cool pic of me and my kid when he was three.” Janice – “huh? Why send me that? Huh? “ Me – “I dunno”. However, posting it on Facebook – entirely different – much more casual. It’s probably amongst the more rationale things that people post there in fact. So I did and once again I’ll state that Facebook is truly the town square that some say it is meant to be. And I’m happy to be able to hang out there. Hope to see you there soon, passing through! 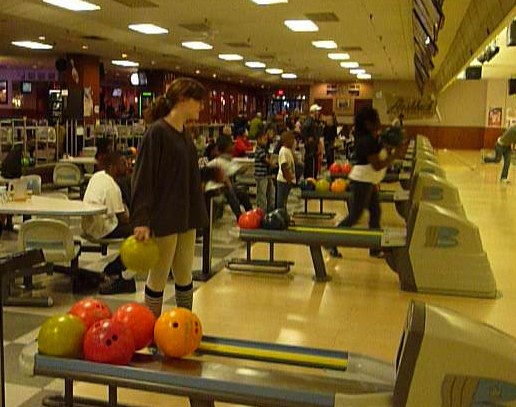 Every time I go bowling I say the same thing – “This is so much fun! Why don’t we do this more often?” …. And then years go by…. I’m in Minneapolis this week to celebrate youngest granddaughter’s 11th birthday. 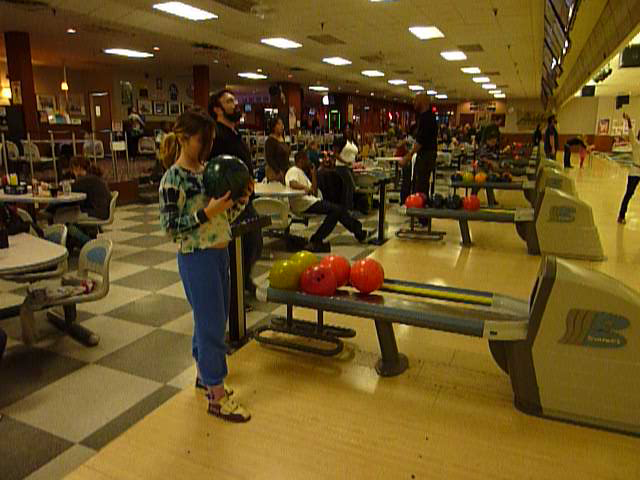 She loves to bowl (she’s enthusiastic about EVERYTHING!) 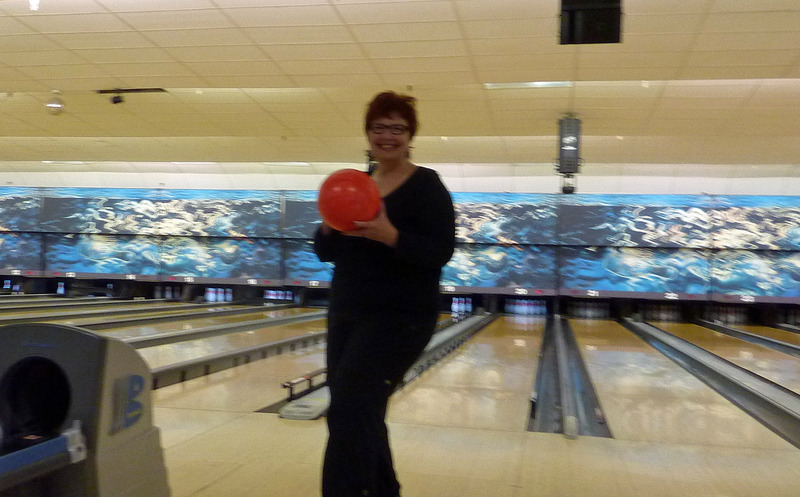 and requested a trip to Memory Lanes. Some things were the same as I remembered – the clutzy shoes, the god-awful food from the snack bar (actually the nachos weren’t too bad) and the FUN! Watching the girls enjoy themselves was the most fun; getting a strike and scoring a hundred in a game was a lot of fun too. Next time I will try to get a ball that my fingers don’t stick to when I try to release it. AND I will know where the foul line is. I didn’t realize until the 8th inning that I was mistaking a floorboard line about a yard and a half behind the REAL foul line for the foul line. And none of those bums told me !! My good intentions (last post in April 2009) went awry last year as life (and death) intervened. Upon reflection I realize that it wasn’t just the time spent travelling – it was more the accompanying state of mind that dampened any energy or enthusiasm I had to create art or talk about it here. Not that things have returned to “normal” – or appear to any time soon. but I’m not waiting for that to happen. Too many ideas and too much to do! Fun stuff. At the moment I’m in Minnesota helping out while my daughter in law recovers from knee surgery. When I was packing I wanted to make sure that I packed some work to do in my down time. And, as you all know, you feel like doing different kinds of quilting, art or needlework according to the mood you’re in. My husband just shook his head when he saw it all go into the suitcase but I know you all understand. Today I actually cut out the fabric for the lap quilt. The scarf grew a little while flying out here; granddaughter’s sweater is on the needles; younger granddaughter has 2 new pairs of earrings. The art quilt has a little of the stitching done – the fingerless gloves haven’t budged. Well, it’s almost time to take my granddaughter to circus school. The knitting goes with me. Thanks for letting me ramble on here. Next post will include pics of some new work.